Don't spend too much money on American Syrah. That's a lesson I've learned from judging at the San Francisco Chronicle Wine Competition. My panel today had 80 Syrahs priced between $30 and $40. It was a good category in that we had few duds. I spoke to people who tasted Cabernet Sauvignon and Merlot in that price range, and they said they were miserable. But we also had few stars. We picked only 7 gold medals, no double golds. Of the seven, two made it only because judges used their one daily "silver bullet," which allows a judge's vote to count twice. There simply wasn't a single immediately recognizable great wine out of all 80 entered. Next door, another panel had Syrahs priced between $10 and $20, and they gave (I believe) 14 golds out of 49 wines. Now, it's possible that we were a particularly tough panel, but I don't think so; our gold percentage going into the day (an important stat for organizers, who get their money from entry fees) was a little above average thanks to a nice group of Sauvignon Blancs from $14 to $20. I also spoke to someone on the panel that got Syrahs over $40, and he said that many were overextracted and overoaked. There may be a lesson in this. Syrah is a pretty easy grape to grow and turn into wine cheaply; that's why it is the foundation of Yellow Tail, and is often Two Buck Chuck's best wine. But trying to tart it up might be counterproductive. The reason we gave so many silvers and bronzes, but so few golds, was excessive hang time; a lot of the $30-$40 Syrahs had nice fruit, but no acid. That's the kind of wine you think you like at first, but get bored with before your glass is done. We also had 26 Muscats, and I spent my silver bullet to make one of them one of our four golds. I'm rather surprised we didn't have more Muscats to judge because many California wineries make a little Muscat to sell in their tasting room to people who only like sweet wines, and tasting rooms are where gold medals have the most sales impact. But after tasting wines with up to 7.8% residual sugar (and we gave that one a silver), my mouth was glad there weren't more. We were just about to leave when the organizers asked if we would judge 9 fruit wines. I'm glad we did, because I got to taste a few products I would never otherwise try. The first four had names that combined fruit and wine: Blackberry Merlot, Raspberry Zinfandel, Strawberry White Zinfandel and Tropical Chardonnay. We thought all four were good efforts at fruit wine: refreshing, not overly sweet, and accurately representing their fruit flavors (if you read "Tropical" as "Pineapple"). We gave the Blackberry Merlot and Strawberry White Zinfandel gold medals, and the latter nearly got a double gold. I liked it a lot more than most White Zinfandels actually made from Zinfandel. We taste all of these wines anonymously, but the odd names made them pretty easy to look up. **Edited from here** And I jumped to an incorrect conclusion when I first posted this, which just shows how effective blind tasting is. 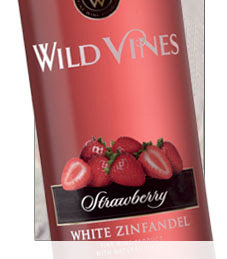 In fact, the wine we loved was a Gallo product, Wild Vines Strawberry White Zinfandel, which sells for under $5. During the sweepstakes round, I discussed the wine (still anonymous at this point) with the judges around me, and we all agreed it was delightful -- refreshing, nice strawberry flavor, not cloying at all. Turns out it was something that, yesterday, I would have mocked. This just goes to show you the value of an open mind, and open mouth. Congrats Gallo, that's a fine product for $5. Your explanation about the Syrah price points makes sense. There are plenty of moderately priced Rhone wines that are delicious and are not overly oaked or extracted. By the way, I am curious about the logistics of the wine competitions. How long do you have with each wine? With so many wines to taste in a short period of time, I cannot imagine that much time can be devoted to each wine. How long before the wines are tasted are the bottles opened? I'm just curious if you have enough time with the wine for it to change in the glass, if that is what it wants (and is wont) to do. When you have 120 wines to taste in a day, there's definitely pressure to move along. We did the 80 Syrahs in about 2 1/2 hours, but that includes the few minutes it takes to clear and replace each flight of 10, as well as all our debating time. One way to not get invited to judge anymore is to be too slow. I try to manage my time by making quick decisions on wines I dislike, and trying to be more thoughtful on wines I like. I think the pace of the competition encourages you to go with your first impression, but I'm not sure that'a a bad thing. If a wine is controversial, I always retaste it while we're talking. Winemakers, overall, are faster judges than writers. We had a very well-respected winemaker on our panel and he was always the first to finish. As for how long the wines are open, the Chronicle Wine Competition is a big production with dozens of volunteers in a huge back room at the Citrus Fair opening wines and bringing them to us in anonymous glasses. I don't know how long they're open, but I think it's probably a few minutes; they probably are opening and pouring one group of 10 while we're tasting the previous one. Some wines do change in the glass, and occasionally a slower taster will notice improvement that the first finishers missed. The upshot is, something like an Amarone that needs two hours of air would not do well in this format, but if the wine only needs 15 minutes of air, by the time we start talking about it, the wine should have opened up.